US - Fuel conservation and lower emissions have been one of the most driving concerns in the modern age. The electric scooter launched by Rakxe more than just manages to impress with a great design and a bevy of interesting features. To begin with, this has been the best attempt at fusing high-specification powered modern technology with a retro feel in quite some time. The company has been in for some serious praise on the ground of this sole feature. Rakxe has brought home the bacon with ease as far in the designing of the vehicle goes. 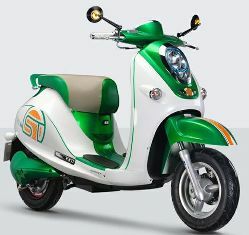 The lean and eye catching green and blue color scheme with some brushes of orange and the sporty graphics impress all. To evolve the retro feel, the two rear view mirrors bulge out well beyond the handlebars. On the specs-front, the electric scooter again manages to do an excellent job. A DC brushless motor with an 800W power supply lies to the core of the power-packed vehicle. The 20Ah capacity Silicon Battery with 48V voltage supply keeps the scooter up and steady for a 65 km range at 45 km/h. All of this is topped by Telescopic Aluminum Hydraulic Shock Absorber and Overstriking Absorber on the front and rear suspensions respectively. The electric city bike is another novelty by Rakxe. The bike has been devised for those growing teenage chaps that refuse to cut down on speed. The motor is again a DC Brushless powerhouse of 250W that just provides the adequate supply of power to teenage riders. The temporary li-ion battery works at a voltage of 33V and packs a capacity of 33V. The max speed of the bike is 402 km/h and it is set to cover more than 50 km with a fully fed battery. Rakxe is an electric vehicle manufacturing company that has already launched a slew of next-gen e-biked and scooters. Company: Rakxe Electric Co., Ltd.